Wow…….Pabst Brewing for sale. I collect Pabst memorabilia of all sorts. The older the better. I couldn’t begin to list the hundreds of items that I have accumulated over the years. From print ads to printing press components to cans and bottles, coasters and openers to match books, fishing lures, glassware and scale model railroad cars. Pabst RULES. 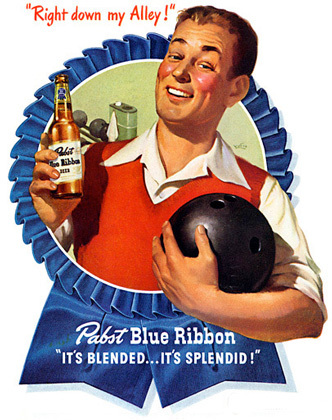 My friends and I always looked at “Blue Ribbon” as a cult beer that was always associated with motorcycles, uh Harley-Davidson. From H-D’s use of Pabst warehouses to store parts during the prohibition to PBR’s sponsorship of H-D’s flat track racing teams, to the first year of “Harley Beer” that was produced by Pabst. Now as a Civil War reenactor in Virginia (artillery) we always celebrate the end of a day of battle with a PBR. It is after all the only period correct beer for the 1860’s. I’ll watch this subject as it transpires and hope that however ewnds up with my favorite “Blue Ribbon” will continue it’s great heritage and most of all it’s great taste.